Every teenager dreams of working in a giant warehouse full of discarded nuclear test equipment, well used high-pressure vacuum fittings and an endless assortment of puzzling devices which may or may not have any value in the modern era. Ok, so maybe not every teenager has this dream, I was and still am somewhat of a strange person, but in High School in New Mexico, this particular dream of mine came true. After tooling around the Los Alamos National Laboratory (LANL) Library and the Bradbury Museum for the better part of a day, my father took a break from coding the labs IBM AS/400 systems he was responsible for and took me to The Black Hole, also known as the Los Alamos Sales Company. He introduced me to Ed Grothus (photo below), an eccentric old fellow who had worked for the lab (what the locals call LANL) until being let go after marching in a peace protest in the '60s. Ed offered me a job, which paid minimum wage, which I believe was about $4.25 in New Mexico. He didn't really tell me what the job would entail, and honestly I didn't care. I had fallen in love with the endless piles of mysterious equipment that filled the former supermarket that had become The Black Hole. As it turned out my job description was quite eclectic and covered everything from taking apart electronic assemblies to recover whatever was valuable inside to helping customers find that centrifuge they were looking for to tearing old lockers out of High Schools. 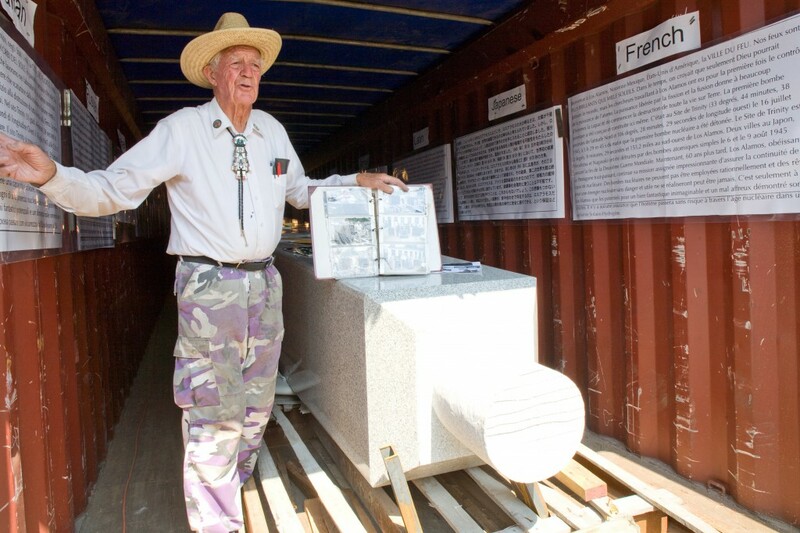 Ed Grothus shows off his Peace Obelisk, one of two identical 3 ton marble obelisks. Ed traveled to China to have the massive monuments hewn from quarried marble and then polished and inscribed. The obelisks will have a message in fifteen languages inscribed in the hematite spheres that the obelisks will rest on. He is still searching for a location to place the monuments, I recommended the Trinity Site. 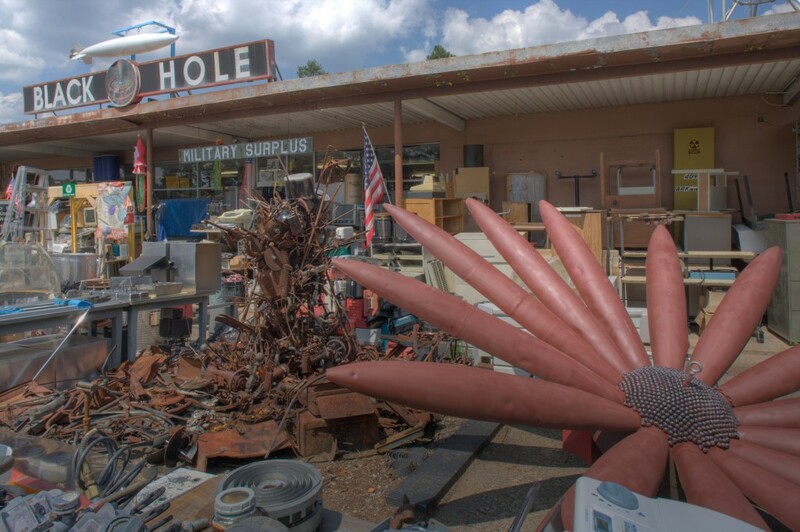 Except for the rusted sculptures and the "Military Surplus" sign, the front entrance to the Black Hole hasn't changed much in the decade and a half since I worked there. The former supermarket, it's parking lot and the church next door no longer sell groceries or facilitate worship, but instead provide cover to millions of salvaged scientific apparatuses. 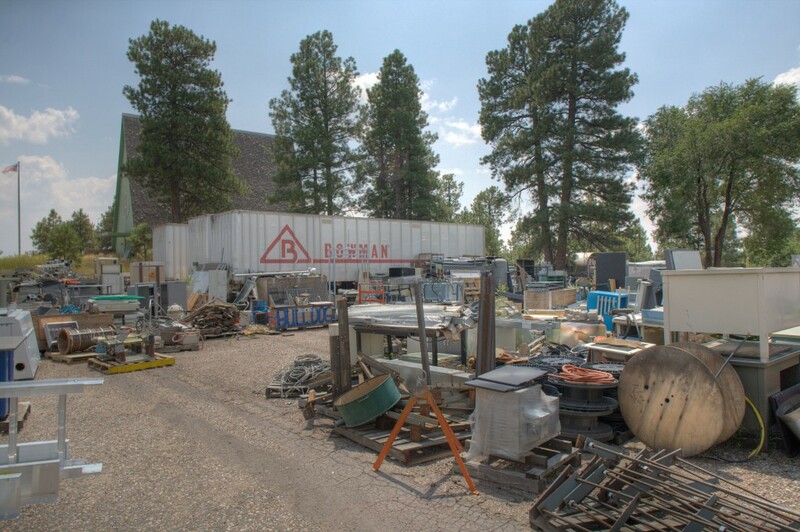 His frequent customers include LANL employees who are ironically buying back the same equipment the lab sold to salvage for pennies on the dollar over the years. Ultra High vacuum equipment is some of the most high-tech looking hardware in the world. Comprised of thick walled stainless steel and machined with great precision for even greater amounts of money, HVac or UHV fittings are designed to withstand extremely high levels of vacuum. They are used for thin-film and spectroscopy research applications which require insane levels of negative pressure. This large device is a Marley High Speed Camera built in England in 1944. The camera is capable of taking 100,000 photos per second. 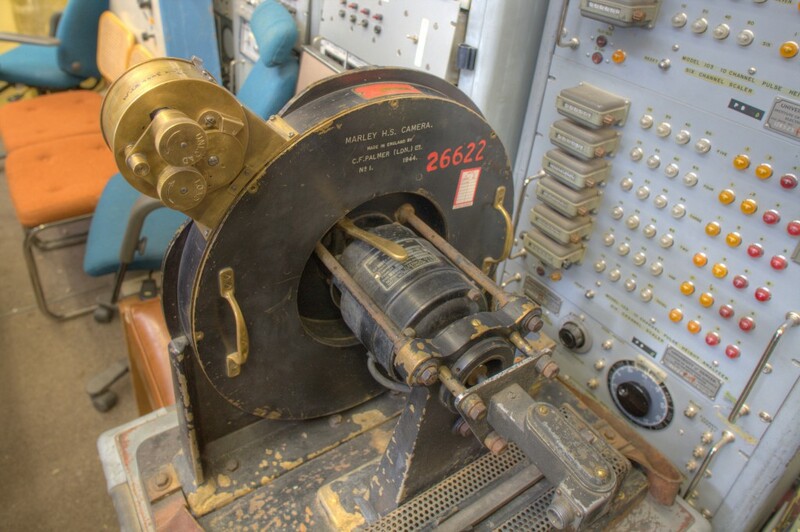 It was most likely used to photograph nuclear or other explosions. To the left of the parking lot in the photo above you can see the A-frame church. 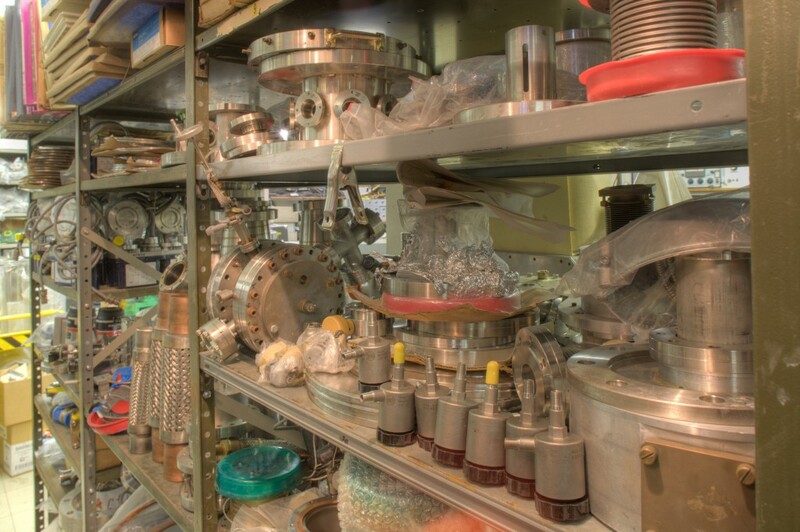 When I worked at the Black Hole, it was filled with especially old, and possibly valuable equipment. The parking lot has been a source of trouble for Ed through the years, after neighbors complained the city of Los Alamos ordered Ed to clean up the lot. He ended up refusing to do so, being arrested, and while he was in jail the city hired a private firm to clean up the Black Hole. Instead of cleaning the parking lot out, they sold most all of Ed's most valuable items and pocketed the profit. As you can clearly see, the yard is still not clean. Last week, LANL was closed upon a security review from National Nuclear Security Administration director and Bush appointee, Linton Brooks and Bush apointee Deputy Energy Secretary Kyle McSlarrow who are now back in DC. The reason for closing the all nonessential sections of the lab (even high security areas like the museum and cafeteria) was a missing removable storage device that contained classified material. The incident is the latest in a series of embarrassments that have prompted federal officials to put the Los Alamos management contract up for bid for the first time in the 61-year history of the lab that built the atomic bomb. Gee, I wonder if Haliburton wil get the contract worth billions of dollars? We're going to start a new cold war.